I totally get and appreciate the way the Angels have handled the loss of Nick Adenhart all season long; his death was unfortunate and he clearly impacted his teammates. 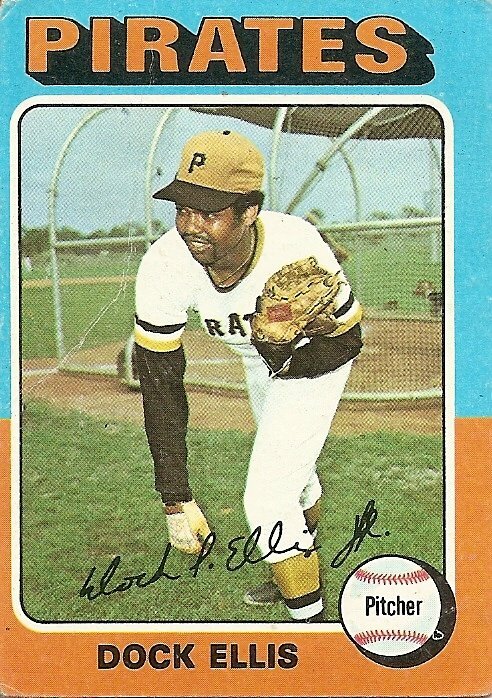 Maybe I’m obtuse, but it seems to me that if you want to honor someone who was killed in a DRUNK-DRIVING accident maybe you don’t POUR BEER all over his uniform and photo on the outfield wall. I mean, am I crazy? I love that they wanted to celebrate “with” him as though he were there, that’s a really wonderful sentiment, but the execution is totally messed up. i don’t have a problem with it. there’s no use pretending that professional athletes aren’t part-time alcoholics, and the time-honored ritual of celebration is champagne. it’d be one thing if adenhart was drunk and that’s how he died, but it was the OTHER person who was drunk and killed him. if there is booze in heaven, i guarantee you adenhart is among those drinking it. Well except that Adenhart’s driver was also drunk. Sure, ball players drink. A lot. But I know I cringed at this and I’m just surprised no one else seems to. well then wouldn’t the best way to honor adenhart be to either a) never drink and drive ever, or b) never drink any booze ever again? if i get killed in an accident by a shallow and cellphone-talking asian woman, does that mean that shallow women, asian women, or cellphones would be banned from my funeral? Alright, I see your point, I think it’s an idiotic one, but I see it. I’m not saying they shouldn’t drink, I’m just saying choosing to hold his jersey up and pour beer and champagne over it is, to me, a poor choice. You can honor him in a different way right? I agree with Slanch. And I certainly hope no one uses a cell phone at my funeral. I’ll rise from the dead and eat a fool. an idiot who made a bad choice in life killed nick adenhart, not alcohol. I have no problem with how they celebrated. Well, the bad choice was driving after drinking, so, yes, the driver made a bad choice, caused by alcohol. slanch is right. this is in poor taste. not as a reflection of adenhart or his character, mind you. but dousing the jersey of the guy who got obliterated by a drunk driver with booze somewhat twisted. it’s not about drinking or responsibility or any of that. it’s about respect, or lack thereof. if someone wanders into gangland crossfire and dies in a hail of bullets, you don’t honor his or her memory by taking a shirt to the shooting range and blasting some holes in it. overall, just a poorly executed, albeit well-meaning, gesture. oh ok so let’s say juan rivera’s dad died from a drunk driving accident, or was an alcoholic who ruined his family. well, juan rivera is on the team and alive. i guess we shouldn’t get any beer or champagne anywhere near him, right? or just make sure to pour it on everyone else’s head but his? if someone gets shot and killed by a gang, are we going to ban the colors red and blue from the funeral? actually, this happens. and more fighting happens anyway. because your apparent myopic, black-and-white definition of society does not apply in that or this case. you can keep bringing up invented situations all you want. as for your lame juan rivera example, that’s a private thing that likely no one would know about except for him. could it be hurtful to him personally? yes. is it a public matter? not unless it somehow becomes one. for adenhart, there was no choice about public or private tragedy. he was a very public example of a young man who was killed before the prime of his life by a wasted driver. this is not a tough correlation, but your morals are your own. if you don’t think there is anything wrong with it, then that’s your opinion. i understand that if he were alive, he would be showered with beer. and that his is alive with that team in spirit. and that pro athelets celebrate with booze all the time. and that there is nothing really wrong with that. that doesn’t change the fact that he was a victim of something tragic that is directly caused by the substance his memory was so recently showered in. in respect of your point, i ask that you respect mine. 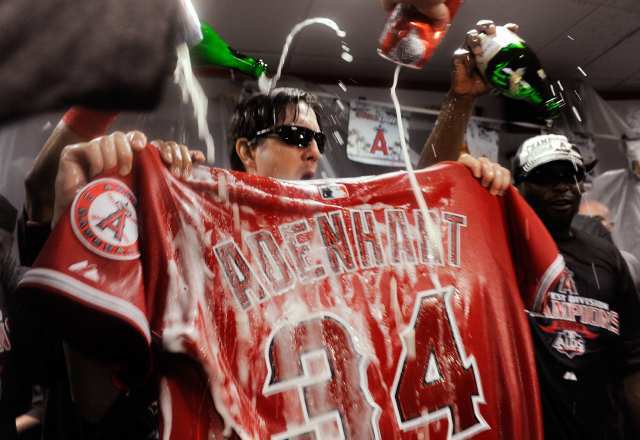 you can celebrate with adenhart’s jersey, I think that’s awesome, but I’m not so sure if pouring beer all over it was the best way, seeing as how alcohol was at the root of why he died. um, ok, well you used an invented situation too, so i guess we’re both wrong/right. but just as you say the juan rivera invented situation would be a private matter, isn’t how the angels decide to honor or acknowledge their fallen teammate their own business and not ours? i mean i’d assume they all have had contact with adenhart’s family, and none of us do. they also played with adenhart and knew him better than any of us. in closing, i’d say the ritual in this case was ironic, but not in poor taste. « ESPN to Air 300 Hockey Games This Season!